Description: Color postcard shows two young women working in a tobacco shed. One girl selects a pair of freshly-picked tobacco leaves from a canvas basket. She will hand them to her partner who is operating a machine which sews the leaves to a string attached to a wooden lath. The laths are hung between rafters in the shed for several weeks until the tobacco cures. 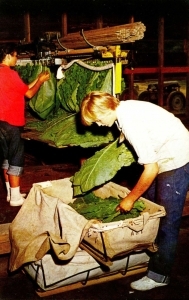 Much of the tobacco grown in the Connecticut River Valley is used for cigar wrappers.